This content is targeted at developers who are looking to update desktop applications to handle display scale factor (dots per inch, or DPI) changes dynamically, allowing their applications to be crisp on any display they're rendered on. To start, if you're creating a new Windows app from scratch, it is highly recommended that you create a Universal Windows Platform (UWP) application. UWP applications automatically—and dynamically—scale for each display that they're running on. Desktop applications using older Windows programming technologies (raw Win32 programming, Windows Forms, Windows Presentation Framework (WPF), etc.) are unable to automatically handle DPI scaling without additional developer work. Without such work, applications will appear blurry or incorrectly-sized in many common usage scenarios. This document provides context and information about what is involved in updating a desktop application to render correctly. As display technology has progressed, display panel manufacturers have packed an increasing number of pixels into each unit of physical space on their panels. This has resulted in the dots per inch (DPI) of modern display panels being much higher than they have historically been. In the past, most displays had 96 pixels per linear inch of physical space (96 DPI); in 2017, displays with nearly 300 DPI or higher are readily available. In these scenarios, UWP applications redraw themselves for the new DPI automatically. By default, and without additional developer work, desktop applications do not. Desktop applications that don't do this extra work to respond to DPI changes may appear blurry or incorrectly-sized to the user. DPI unaware applications render at a fixed DPI value of 96 (100%). Whenever these applications are run on a screen with a display scale greater than 96 DPI, Windows will stretch the application bitmap to the expected physical size. This results in the application appearing blurry. Desktop applications that are system DPI aware typically receive the DPI of the primary connected monitor as of the time of user sign-in. During initialization, they lay out their UI appropriately (sizing controls, choosing font sizes, loading assets, etc.) using that System DPI value. As such, System DPI-aware applications are not DPI scaled (bitmap stretched) by Windows on displays rendering at that single DPI. When the application is moved to a display with a different scale factor, or if the display scale factor otherwise changes, Windows will bitmap scale the application's windows, making them appear blurry. Effectively, System DPI-aware desktop applications only render crisply at a single display scale factor, becoming blurry whenever the DPI changes. It is recommended that desktop applications be updated to use per-monitor DPI awareness mode, allowing them to immediately render correctly whenever the DPI changes. When an application reports to Windows that it wants to run in this mode, Windows will not bitmap stretch the application when the DPI changes, instead sending WM_DPICHANGED to the application window. It is then the complete responsibility of the application to handle resizing itself for the new DPI. Most UI frameworks used by desktop applications (Windows common controls (comctl32), Windows Forms, Windows Presentation Framework, etc.) do not support automatic DPI scaling, requiring developers to resize and reposition the contents of their windows themselves. When running in Per-Monitor v2 Awareness mode, applications are notified when their DPI has changed. If an application does not resize itself for the new DPI, the application UI will appear too small or too large (depending on the difference in the previous and new DPI values). Per-Monitor V1 (PMv1) awareness is very limited. It is recommended that applications use PMv2. No DPI scaling of any UI elements. Per-Monitor V1 DPI awareness mode (PMv1) was introduced with Windows 8.1. This DPI awareness mode is very limited and only offers the functionality listed below. It is recommended that desktop applications use Per-Monitor v2 awareness mode, supported on Windows 10 1703 or above. On Windows 10 1607 or above, PMv1 applications may also call EnableNonClientDpiScaling during WM_NCCREATE to request that Windows correctly scale the window's non-client area. In order to update an existing desktop application to handle DPI scaling properly, it needs to be updated such that, at a minimum, the important parts of its UI are updated to respond to DPI changes. Most desktop applications run under system DPI awareness mode. System-DPI-aware applications typically scale to the DPI of the primary display (the display that the system tray was located on at the time the Windows session was started). When the DPI changes, Windows will bitmap stretch the UI of these applications, which often results in them being blurry. When updating a System DPI-aware application to become per-monitor-DPI aware, the code which handles UI layout needs to be updated such that it is performed not only during application initialization, but also whenever a DPI change notification (WM_DPICHANGED in the case of Win32) is received. This typically involves revisiting any assumptions in the code that the UI only needs to be scaled once. Mark the process as per-monitor DPI aware (V2) using an application manifest (or other method, depending on the UI framework(s) used). Make UI layout logic reusable and move it out of application-initialization code such that it can be reused when a DPI change occurs (WM_DPICHANGED in the case of Windows (Win32) programming). Invalidate any code that assumes that DPI-sensitive data (DPI/fonts/sizes/etc.) never need to be updated. It is a very common practice to cache font sizes and DPI values at process initialization. When updating an application to become per-monitor DPI aware, DPI-sensitive data must be reevaluated whenever a new DPI is encountered. When a DPI change occurs, reload (or re-rasterize) any bitmap assets for the new DPI or, optionally, bitmap stretch the currently loaded assets to the correct size. Grep for APIs that are not Per-Monitor DPI aware and replace them with Per-Monitor DPI-aware APIs (where applicable). Example: replace GetSystemMetrics with GetSystemMetricsForDpi. Test your application on a multiple-display/multi-DPI system. For any top-level windows in your application that you are unable to update to properly DPI scale, use mixed-mode DPI scaling (described below) to allow bitmap stretching of these top-level windows by the system. When updating an application to support per-monitor DPI awareness, it can sometimes become impractical or impossible to update every window in the application in one go. This can simply be due to the time and effort required to update and test all UI, or because you do not own all of the UI code that you need to run (if your application perhaps loads third-party UI). In these situations, Windows offers a way to ease into the world of per-monitor awareness by letting you run some of your application windows (top-level only) in their original DPI-awareness mode while you focus your time and energy updating the more important parts of your UI. Below is an illustration of what this could look like: you update your main application UI ("Main Window" in the illustration) to run with per-monitor DPI awareness while you run other windows in their existing mode ("Secondary Window"). Prior to the Windows 10 Anniversary Update (1607), the DPI awareness mode of a process was a process-wide property. Beginning in the Windows 10 Anniversary Update, this property can now be set per top-level window. (Child windows must continue to match the scaling size of their parent.) A top-level window is defined as a window with no parent. This is typically a "regular" window with minimize, maximize, and close buttons. The scenario that sub-process DPI awareness is intended for is to have secondary UI scaled by Windows (bitmap stretched) while you focus your time and resources on updating your primary UI. To enable sub-process DPI awareness, call SetThreadDpiAwarenessContext before and after any window creation calls. The window that is created will be associated with the DPI awareness that you set via SetThreadDpiAwarenessContext. Use the second call to restore the current thread s DPI awareness. While using sub-process DPI scaling enables you to rely on Windows to do some of the DPI scaling for your application, it can increase the complexity of your application. It is important that you understand the drawbacks of this approach and nature of the complexities that it introduces. For more information about sub-process DPI awareness, see Mixed-Mode DPI Scaling and DPI-aware APIs. Changing the display that you use as the primary display, signing out of Windows, then re-testing your application after signing back in. This is particularly useful in finding code that uses hard-coded sizes/dimensions. Prevent the application window from getting into a recursive dpi-change cycle where one DPI change triggers a subsequent DPI change, which triggers yet another DPI change. If you have application-specific requirements that prevent you from using the suggested rectangle that Windows provides in the WM_DPICHANGED message, see WM_GETDPISCALEDSIZE. This message can be used to give Windows a desired size you'd like used once the DPI change has occurred, while still avoiding the issues described above. When an HWND or process is running as either DPI unaware or system DPI aware, it can be bitmap stretched by Windows. When this happens, Windows scales and converts DPI-sensitive information from some APIs to the coordinate space of the calling thread. For example, if a DPI-unaware thread queries the screen size while running on a high-DPI display, Windows will virtualize the answer given to the application as if the screen were in 96 DPI units. Alternatively, when a System DPI-aware thread is interacting with a display at a different DPI than was in use when the current user's session was started, Windows will DPI-scale some API calls into the coordinate space that the HWND would be using if it were running at its original DPI scale factor. When you update your desktop application to DPI scale properly, it can difficult to know which API calls can return virtualized values based on the thread context; this information is not currently sufficiently documented by Microsoft. Be aware that if you call any system API from a DPI-unaware or system-DPI-aware thread context, the return value might be virtualized. As such, make sure your thread is running in the DPI context you expect when interacting with the screen or individual windows. When temporarily changing a thread's DPI context using SetThreadDpiAwarenessContext, be sure to restore the old context when you're done to avoid causing incorrect behavior elsewhere in your application. Many legacy Windows APIs do not include a DPI or HWND context as part of their interface. As a result, developers often have to do additional work to handle the scaling of any DPI-sensitive information, such as sizes, points, or icons. As an example, developers using LoadIcon must either bitmap stretch loaded icons or use alternate APIs to load correctly-sized icons for the appropriate DPI, such as LoadImage. A CreateWindow call where the passed in parent window is of a different DPI awareness mode than the calling thread. 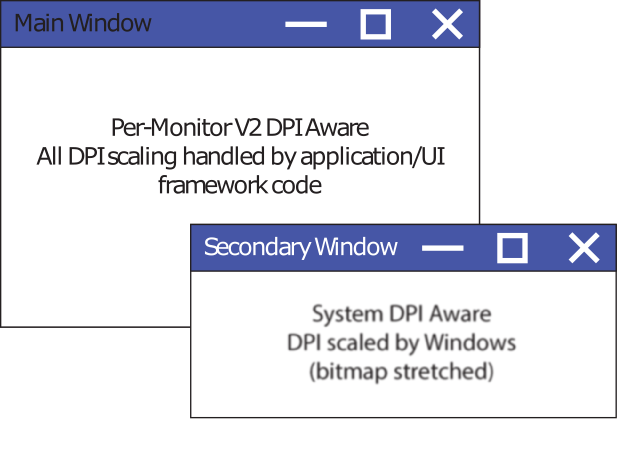 A SetParent call where the two windows are associated with different DPI awareness modes. Mixed-Mode DPI Scaling and DPI-aware APIs.